We are a traveller only hostel. Proof of forward travel may be requested at anytime. No Miami or connecting county residents. 18 years or older accommodation. A valid credit or debt card is needed to have on file at check-in time or a $50 cash deposit. Check-in time is from 1400 - 0200. 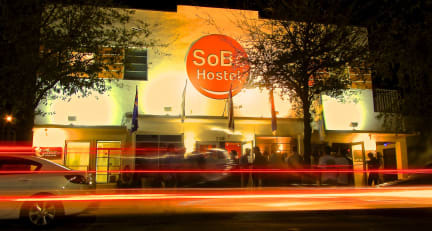 SoBe Hostel is located only 2 blocks from South Beach’s beautiful white sand beaches; and short minutes from the best nightclubs, lounges, bars, pubs, restaurants, and shops that Miami Beach has to offer. Our goal is to provide you with the best customer service and atmosphere, we want you to love Miami as much as we do. SoBe Hostel will take care of you in a way nobody else does… We give you the best value for your money so you can enjoy Miami to the fullest while still staying within your budget. Our staff has the best reputation in town and they are available 24/7 to assist you with all of your needs. So, here is the big question, why are you choosing to visit Miami? If your answer is “TO PARTY!” you have come to the right place! SoBe Hostel is known as one of the TOP party hostels in all of Miami. We promise to provide you with the best “club nights” events EVERY NIGHT! Our newly renovated HANGOUT BAR, located in the lobby, is where you will find the best and CHEAPEST drinks in South Beach. In the lounge area you will be able to watch TV, listen to music, and access the hostel’s COMPLIMENTARY Wi-Fi, play games, and most importantly MEET NEW FRIENDS! Beyond the bar we have other communal areas for you to socialize and hang out! Which includes the lobby, our newly added Patio, sidewalk dinning/seating front of the hostel and a shared kitchen. We have co-ed dorms as well as all female dorms with bunk beds to accommodate 4, 6, 8, and 12. All rooms have shared bathrooms and each bed comes with a BIG locker for you to put your luggage and valuables in. Traveling Heavy? No worries, we have extra luggage storage behind the front desk. When you stay at SoBe you are joining our AWESOME family… and we ALWAYS take care of our family. EVERGLADES – KEY WEST- MIAMI CITY TOUR- BOAT TOURS- ORLANDO PACKAGES- AND MUCH MORE! It`s a good place, but they put a lot of beds in one room that dont have enough space, so not every bed has socket and light. The firt day when I arrive the room didnt smell good, because there is no good circulation in the room. In the other day they cleaned the room, so smelled better. The staff look like is tired about receive people, I had no friendly reception But it`s a good location, good breakfast, Thank you. Nice Hostel to people that want to stay in South Beach. It's clean and has good rules to keep the place safe and organized. I had a bad experience at the reception as soon as I arrived. I just asked to do my check in and go to sleep (I had been all night in the airport because of a problem with my flight). But he couldn't do the check in a little bit earlier and the guy in the reception was not so helpful and polite. Maybe is because a high season in Miami, I don't want to judge, but they should show some more respect. In the end, I wasn't comfortable to stay and moved to another hostel. Lost the fee tax anyway. Quartos muito pequenos, falta de reparos, beliches enferrujadas, chuveiros com a instalação elétrica visível. Fizemos a reserva para 3 noites, mas em menos de 12 horas fizemos checkout e procuramos outro lugar para ficar as outras 2 noites. O lugar possui odor ruim, barulhento e está em péssimo estado de conservação. Fico em hostels desde 2011 e essa foi a primeira vez que tive de sair e procurar outro lugar para ficar antes de terminar a estadia. Não se parece em nada com as fotos. Portas que não fecham, camas desconfortáveis e barulhentas, lockers quebrados, etc..Definitivamente não recomendo.